Public questions all on the Sustainability and Transformation Plan (STP) were asked by Sarah Stock Fighting 4 Grantham Hospital (F4GH), John Morgan SOS Grantham Hospital (SOSGH) and Cllr Mark Whittington. 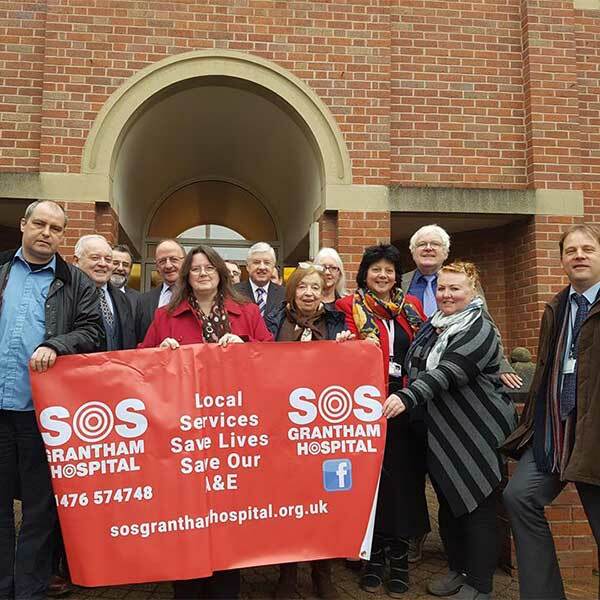 A cross party motion was put forward by Cllr Ray Wootten (Cons) seconded by Cllr Charmaine Morgan (Lab) also chair of SOS Grantham Hospital (SOSGH) opposing the Lincolnshire STP. The main concerns were that the STP relies on switching focus away from hospitals to alternative providers but there are issues with GPs and other key providers being able to meet current workloads. More work would worsen the situation rather than improve it. The further centralisation of key services will mean patients travelling further, taking longer to get access to care with acutely ill at more risk and more pressure on East Midlands Ambulance Service (EMAS). Cllr Morgan said the STP should provide an opportunity to reinstate A&E services everywhere. At least 3 A&E units are needed if not 4 given the size of the county. The motion was passed at SKDC on 19 January but with 3 abstains so not a unanimous vote. Cllr Morgan asked leader Bob Adams to support our concern Teresa May stating ‘STPs are local to reflect local people’. Pointed out councils have very little say in consultation and none in decision-making. Cllr Adams confirmed SKDC opposition to the STP. Cllr Wootten highlighted high number of patients using Grantham A&E. 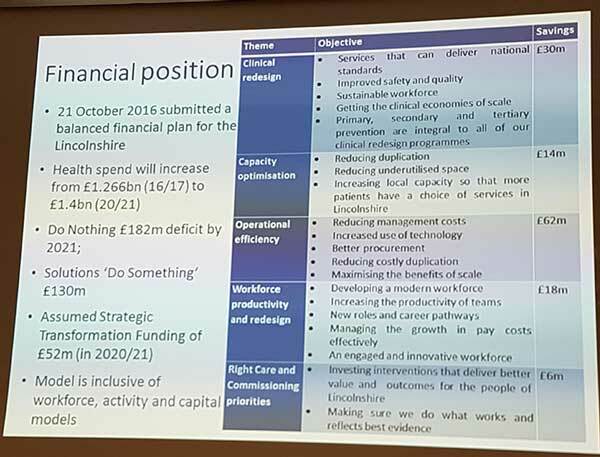 Alan Kitt gave a presentation on Lincolnshire Health & Care STP. He noted concerns raised prior to his presentation and spent some time preempting arguments and concerns we may have. For key deliverables see attached photo of summary slide. He stated lack of GPs an issue now. There was a question session afterwards. A number of councillors had experiences using local emergency and GP services. The need to re-visit GPs for blood tests and variance in timescale for follow up blood test appointments was raised. Two councillors had direct experience of life threatening heart failure. The confusion and anxiety for a patient with dementia being required to travel a distance for care was discussed. The F4GH question raised comments via Cllr Morgan. They suggested a number of ideas on how Lincolnshire Health and Care (LHAC) properly consult with the community. Cllr Morgan Chair SOSGH asked if LHAC would change the STP based on responses and asked how LHAC would demonstrate they had listened. Alan Kitt objected to Cllr Morgan suggesting the Clinical Commissioning Group (CCG) don’t ‘do proper consultations or listen’. In response Cllr Morgan recalled the 2013 SOSGH/GHDC experience when maternity was lost in Grantham. She told council members how the media were told only 80 babies born a year when in fact 1000+ born in Grantham Hospital catchment area. West Grantham catchment area residents, including Newark were not consulted. The CCG focused on Grantham town & east i.e Sleaford, which is nearer to Lincoln and whose residents use Grantham less. Alan Kitt said they had to follow guidelines. Issue: is it possible LHAC will not consider Grantham A&E cross boundary catchment area? NB Cllr Morgan will check with LHAC. ClIr Morgan & Cllr Tracey Foreman continued discussion with Alan Kitt at recess. It was agreed a political solution is needed given pressures on our county health services. At LCC Cllrs stated they could give more supporting evidence to help ULHT get more funding but ULHT did not work with councillors. Alan Kitt wants to reopen Grantham hospital A&E 24/7 but is considering how to sustainably staff the unit. Cllr morgan argued to keep resuscitation and skills of middle grade doctors. ‘Like Skegness, Grantham is too far from anywhere else to transfer critically ill patients.’ There was agreement ALL Lincolnshire’s hospitals are too far from anywhere else,’ including Skegness which has 2million summer visitors and plans for 4million, yet has no local A&E. Alan Kitt is concerned Grantham A&E uses costly consultants who he says are barely used. He is considering options. Cllr Morgan challenged the LHAC presentation of the scope of resuscitation work at Grantham. She said it was far greater than stated. Alan Kitt said the trust and CCG managers had been both surprised and concerned especially how cancer patients were being supported. Cllr Morgan suggested she forward the list of acute scenarios covered and he can consider what he thinks is contentious. The scope of the LHAC meeting on 25 January was also discussed. It will not be restricted to the draft STP proposals considered by LHAC to be a working document. Cllr Morgan advised SOSGH will submit User Requirements. The SOSGH petition has now climbed over 45k uk signatures. There is a proposal to aim for 50k.